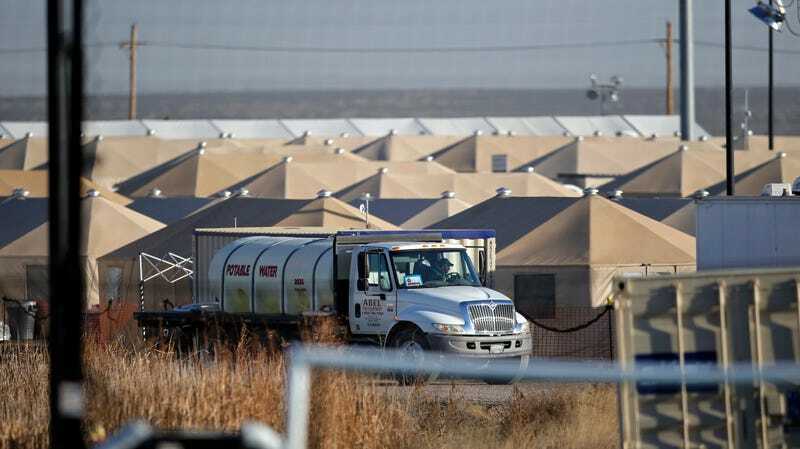 A Tornillo, Texas tent city will release the 2,500 children being detained there to the care of sponsors or family members by January 15. According to The New York Times, BCFS, the non-profit that operates the tent city, will not renew its government contract, which expires on December 31. The shelter opened in June, and many of the children have been there since that time. Representative Beto O’Rourke, who visited the detention center alongside dozens of protestors on December 23, said the taxpayer-funded tent city has cost $144 million, and the price of detaining a single child in the tents, located in the desert outside El Paso, is $400 a day. According to The Guardian, overcrowding is also an issue, as the facility was only intended to house about 300. In hastening the release of the children housed at Tornillo and other detention facilities, The Department of Health and Human Services has eased screening requirements for the households where children will live. Only the child’s sponsor will be fingerprinted now, as opposed to every member of the household. And while adults sponsoring minors will still be subject to criminal and background checks, others in the home will not be required to undergo the same vetting process. On December 23, demonstrators gathered to sing Christmas carols outside the barbed wire for children who will be spending the holiday inside the tent city, since limited space on holiday flights has made it impossible for them to join their families or sponsors before the new year.